Continued rocket fire on Israel's south will keep many schools in the south closed for at least another day. Beer Sheva, Ashkelon, Ashdod, Kiryat Malachi, and Ofakim, all announced their schools will remain closed on Tuesday. Gan Yavne also announced there would be no school in Tuesday, but noted twelfth graders would learn in fortified rooms and special education children would be sent out of the settlement to schools more than 40 kilometers from Gaza. However, the Negev Regional Council announced that kindergartens, elementary schools and high schools will be held tomorrow as usual. Middle schools will reportedly conduct classes via the Internet. In addition, Ben-Gurion University in Beer Sheva announced there will be no classes or exams on Tuesday. University officials said the decision was made after discussions with officers from the IDF Home Front Command. The university said public university students and employees would be sent safety guidelines via email, and that that the university Website would update them about changes to the curricula. The announcements came as no fewer than 40 rockets rained down on Israel's southern communities. Most rockets were intercepted by Israel's Iron Dome anti-rocket systems. However, one rocket injured an 80 year old woman, who sustained light shrapnel injuries in her leg. She was taken to Kaplan Hospital in Rehovot. An additional 13 people were treated for shock. 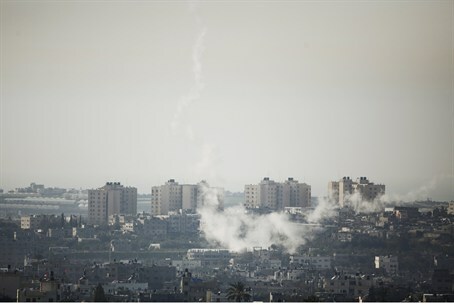 Throughout the morning hours terrorists fired volleys of Qassam rockets and mortar shells at communities in the Gaza belt region. Rockets exploded in open areas around Sderot and the Eshkol Regional Council and Hof Ashkelon. Three mortar shells landed near the Kerem Shalom crossing. One struck a truck transferring aid supplies from Israel to Gaza. Following the attack the crossing was temporarily closed, but the Civil Administration has since ordered it reopened. The school closures come as the Knesset's powerful Foreign Affairs and Defense Committee called on the government to declare a "special situation" in Israel's south. Doing so would allow the government to provide compensation to local families for costs incurred by the disruption of their daily lives by the escalated rocket fire, including lost pay due to remaining home with children whose schools are closed.